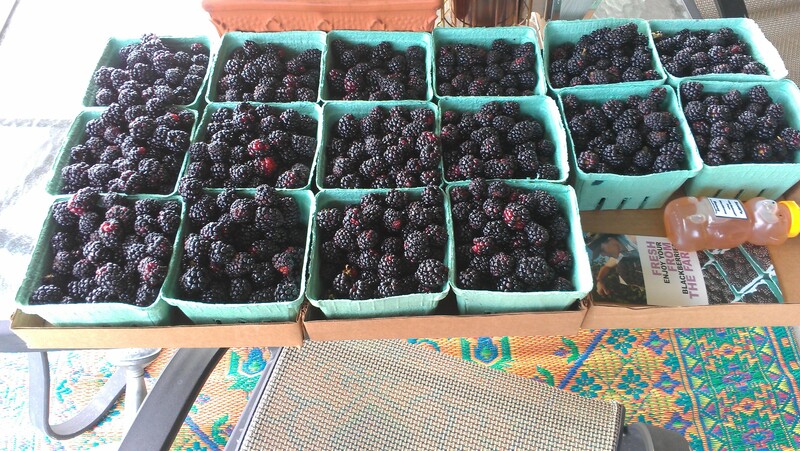 It’s blackberry pickin’ time again! We also bought a small bear of blackberry honey. They were abundant and huge. This was the norm not the exception. 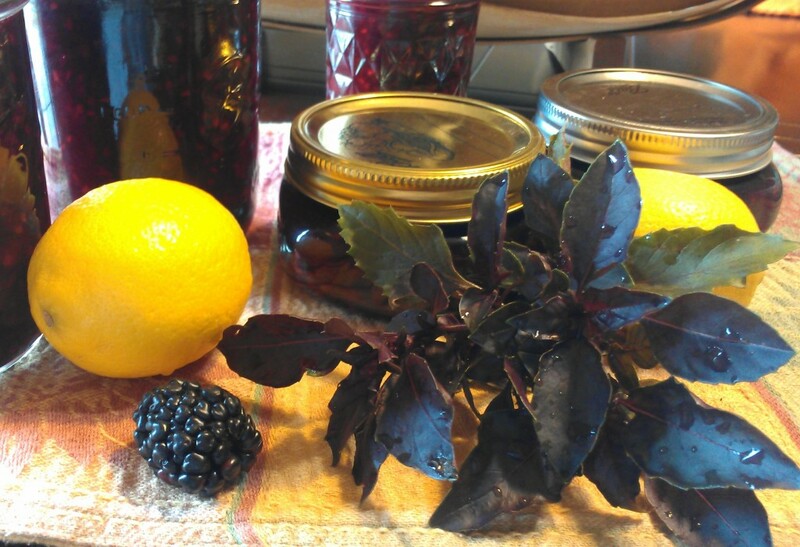 I found an interesting recipe for “Blackberry Jam with Lemon Basil.” Not having any lemon basil in the herb garden, I went out to see what I did have. Aha! Cinnamon basil. Sounded like a substitute for me. I tweaked the instructions just a bit. In a large kettle, combine berries, sugar and lemon juice. Stir while heating slowly. A few of the berries will be crushed but don’t use a potato masher like some jam recipes call for, just gently stir while sugar is dissolving. Remove from heat. I had very little foam on this jam, but if you have any appear, skim it off at this time. Place the basil sprigs in the jam and stir. Let steep for 4-5 minutes. Remove sprigs with tongs and discard. Place jam into hot sterilized jars and seal. Make sure to listen for pops. If they don’t seal, store in refrigerator. This recipe made four pints of jam. This is a pretty tangy jam but the slight hint of cinnamon from the basil definitely comes through. I already sent one half pint to a friend for taste testing. I had to call my mom (the old home ec. teacher) when it came to Rachel’s tips on sterilizing jars. She sterilizes her jars in the oven. Mom says that that is an old way to do it and according to modern canning tips and techniques, it is outdated and may not be safe. However, when I asked mom about water bathing the jam (which Rachel doesn’t have in her instructions), mom said she never does that with her jam either BUT that modern tips and techniques do advocate a water bath for all canned goods. So, I will leave you with this information and you can process your jam as you see fit. If in doubt, store it in the freezer or refrigerator until ready to use. My next experiment involved limes. I loved the blackberry margaritas we made last year, so I wanted to capture that lime essence in a jam. This time, I used liquid pectin and sort of followed the recipe in the insert. 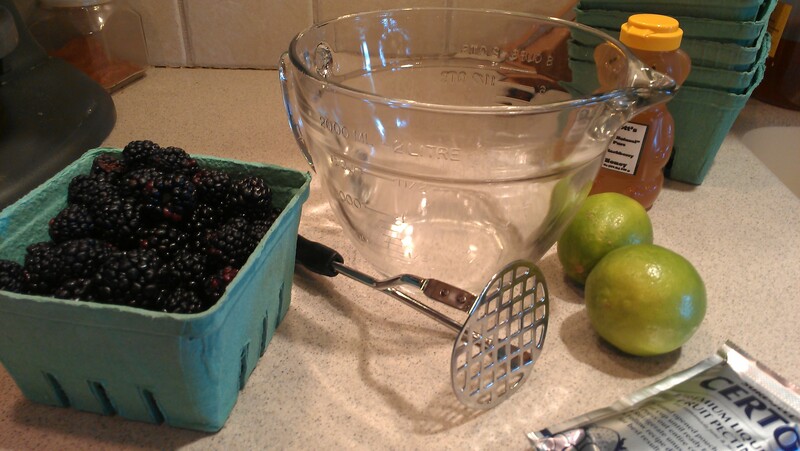 Wash and rinse blackberries and crush. You will need 2 cups of crushed berries. (A potato masher works best for this.) Keep the berries fairly chunky. Stir sugar into crushed fruit and let set for 10 minutes, stirring occasionally. In a separate small bowl, stir together liquid pectin and lime juice. After the ten minute, stir in the pectin-lime mixture. Stir constantly until sugar is dissolved, about three minutes. Pour into prepared containers. Make sure you leave a 1/2 inch gap at the top. Jam will expand in the freezer. I also broke down and made a traditional jam with lime juice and lime zest (similar to the freezer jam version) and the SEVEN CUPS OF SUGAR! I used the recipe on the pectin insert and just added the juice of one lime and about two teaspoons of lime zest. That’s a lot of jam. Wow—I still had blackberries left. 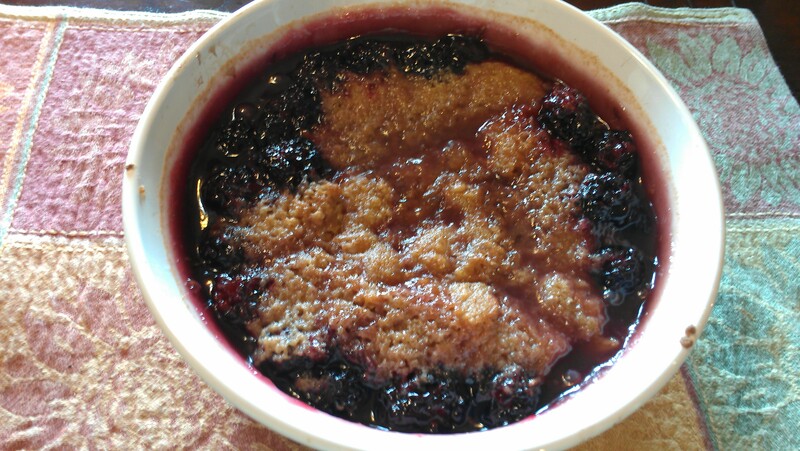 I made a blackberry cobbler based on Blueberry Lavender Cobbler with Ginger Struesel. 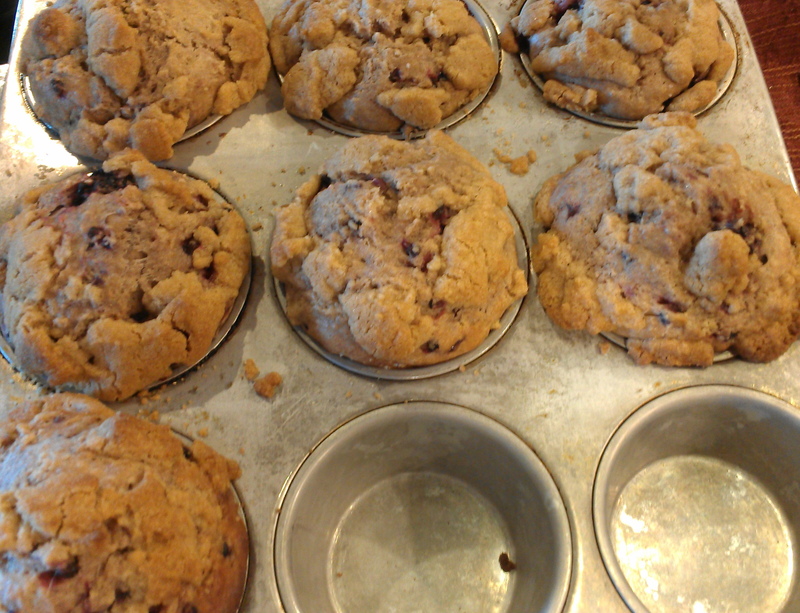 I had a whole lot of struesel left over so I made some blackberry muffins and topped them as well. I then whipped up a pitcher of blackberry-lime margaritas. Whew! Twenty pounds of blackberries yielded fifteen pints of assorted jam, one cobbler, seven jumbo muffins, and a gallon and a half of frozen berries! 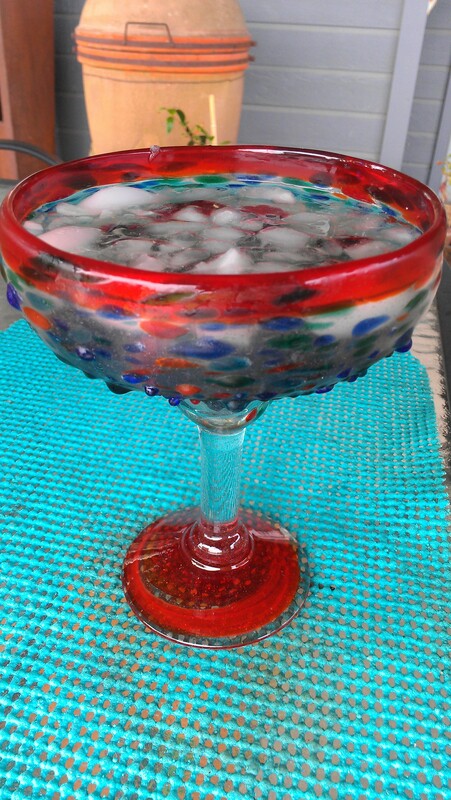 Oh, yeah, and the margaritas. I am going to go have a glass now! 19 comments to It’s blackberry pickin’ time again! I would KILL for some of that jam! Blackberries are my favorite berry! All those berries in 20 minutes? That’s unbelievable! Looks like you have some great eating (and drinking) ahead of you. 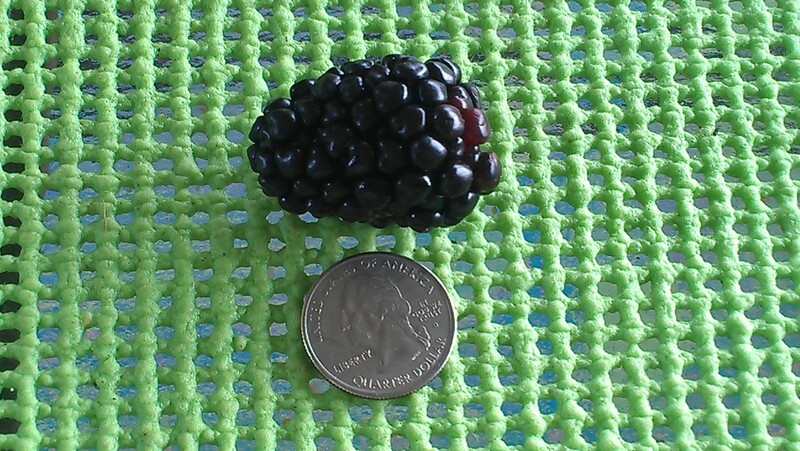 Wow, those are some stunning blackberries–but I need a picture of the cute farm dog! That first jam recipe sounds interesting, as I’m not sure I even know what cinnamon basil is. It is a purple-hued basil that has a soft spicy scent. I am a basil-addict when it comes to plantings in the herb garden. Maybe I can get a pic of the farm dog when we return to cut our Xmas tree—it is a Christmas tree farm too. The blackberries look amazing and so does the jam! Perfect over a slice of warm bread! 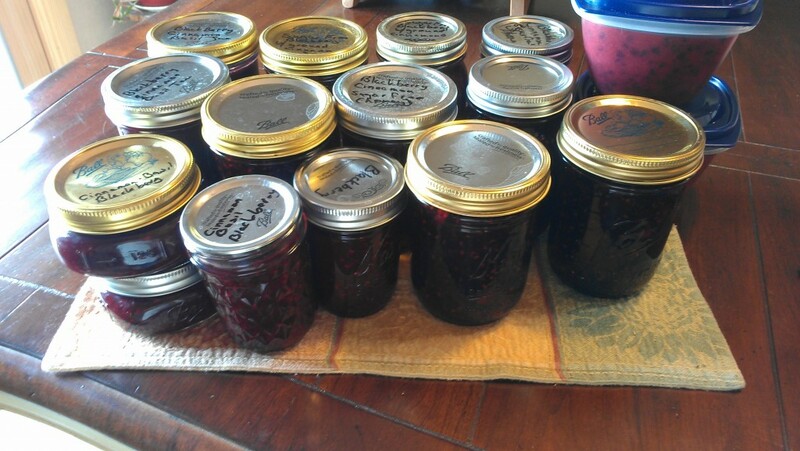 Most of this jam (except for the 7 cup of sugar variety) came out pretty tangy. WOW, those are some awesome recipes for all those blackberries! Thanks, Jenn and Seth. I would like some more blackberry margaritas! 🙂 I am looking for more bake goods recipes to use up our jam surplus!